It is a ProCyte SOD product and it has its bases in the Iamin discovery by Dr. Loren Pickart. It is a spray liquid bottle 180 ml (6 fl.oz). It is also used 1 ml / day (6 months of provisioning). deionezed water, SD alcol 40B, amodimetlcotone, nonoxynol-10, pantenolo, poliquaternium-11, polisorbato 60, tallowtrimonium chloride, acido citrico, dimetil laurimine isosterate, linoleaminodopropyl etil dimonium etosolfato, triamino copper nutritional complex (alanina/istidina/lisina rame polipeptide HCL), metilparaben, benzetonium chloride, mentolo. This product is the result of scientific searches on the copper and on the relations with the skin health. A meaningful increase of hair in anagen phase has been measured in a 6 month-old clinical study using a copper peptide topical solution. It stimulates the fibroplastis, the collagen synthesis and the enzymatic system which are important for the skin and hair health. Other characteristic would be to repair the skin around the follicle and to improve therefore the function of the follicle. When properly formulated with specific aminoacidis, the copper can have brought directly to the follicles. The SOD in tricomin solution is a "Blue copper peptide". 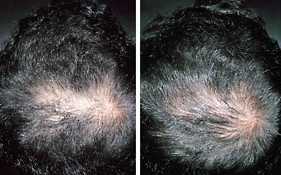 Tricomin solution can be used with effectiveness as supplement to other treatments as Rogaine and Propecia. Have other source from SOD together with Dr. Proctor products and to the Folligen! Is Copper Better Than Propecia� for Blocking DHT Production? Copper ion is more effective in inhibiting the type 1 form which primarily produce the DHT that damages follicles and can be administered locally to the skin. Sugimoto et al (Sugimito 1995) found that copper ion is a potent inhibitor of 5-alpha reductase, inhibiting both types of 5-alpha reductase (both type 1 and type 2) that produce DHT and is the only metal to do so. Copper ion inhibits (50% reduction in activity) type 1 alpha reductase at 1.9 micromolar (0.12 micrograms copper ion per milliliter) and type 2 alpha reductase at 19.2 microM (1.2 micrograms copper ion per milliliter). No other metal has these effects. The application of copper-peptides may provide sufficient copper ion into the hair follicle area to block DHT production in the scalp. Metabolically active copper ion (that is, copper ion free to block 5-alpha reductase) in the human body exists at about 1 microgram per milliliter in the blood and less in the skin. While the uptake of ionic copper from copper-peptides applied to the scalp is very low, human experiments by Prof. John Sorenson (University of Arkansas) have found that they can raise copper ion levels in the skin to the effective level of 1 microgram per millimiter. Q: Did you know that your hair is relatively rich in copper? A: Also true. Compared to most other parts of your body, your hair has a natural affinity to copper. It is also interesting to know that copper levels in the body tend to decrease as you get older, just when you may need it more! Q: Did you realize that your hair follicles cycle between growth periods and resting periods? A: True again! In fact, hair thinning and loss can result from changes in the hair cycle resulting in a process known as miniaturization. Tricomin story is Growing!! Studies have demonstrated the positive effects of Triamino Copper Nutritional Complex� on hair follicles! During the growth phase, the base of the follicle (dermal papilla) is richly endowed with substances such as collagen and various proteins. These substances are virtually absent during the resting phase. Copper has been shown to stimulate the cells responsible of production of these substances! As shown, Tricomin products target delivery of copper to the base of the follicle. In addition to copper, other components of the Tricomin products (such as panthenol) add desirable structural qualities to the hair, building its body and adding it shine. While Tricomin�s cosmetic benefits will be realized in a short-term, the added benefits of the Triamino Copper Nutritional Complex� may require a longer using period. As the centerpiece of the product line, Tricomin Solution � Follicle Therapy Spray combines the highest concentration of copper peptide with an excellent leave-in conditioner framework. 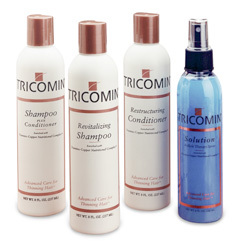 Tricomin products can be used effectively with other hair treatments including Rogaine� and Propecia�, providing additional benefit to the hair follicle and surrounding environment.